A violent brawl that seriously injured three people broke out at the Brazilian football league season end on Sunday. 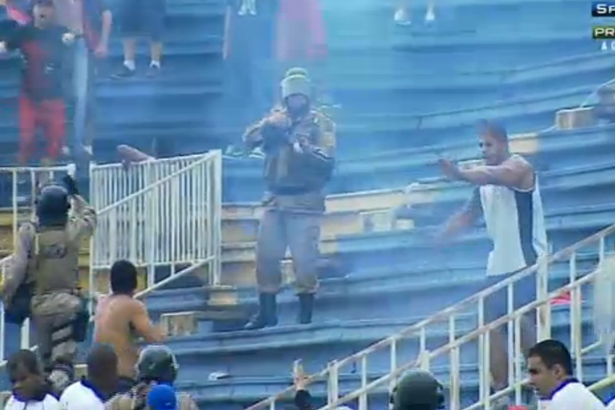 A match in southern Brazil was stopped by fan violence in the stands, police fired rubber bullets to contain the crowd and an injured man was airlifted by helicopter to a hospital. A doctor said two other fans were hospitalized in serious condition and one was treated for a minor injury at the stadium in the southern city of Joinville. TV images showed seemingly unconscious men being kicked in the head despite appeals from football players. A helicopter landed on the pitch to transport an injured man to hospital. The shockingly violent scenes, broadcast live to millions of homes on Sunday afternoon, are bound to raise questions about Brazil’s ability to keep fans safe during next year’s World Cup, correspondents say. The brawl in the Arena Joinville, in the southern state of Santa Catarina, started during the first half of the match. One of Atletico Paranaense’s players was filmed crying after witnessing fans being viciously beaten. “I’ve been playing for 20 years and I’ve never seen anything like this in person. We will have a World Cup in our country and we know these images will be shown everywhere,” defender Luiz Alberto told reporters.